June Employee of the Month Adam Ball is pictured with Jenny Jenkins, radiology coordinator and Glen Washington, FACHE, PVH CEO. Pleasant Valley Hospital (PVH) is pleased to announce the Customer Service Employee of the Month for June 2018 is Adam Ball. Ball has been employed in the Radiology Department since February 2015 as a multi-discipline tech. The Employee of the Month at PVH is nominated for taking extra steps to provide excellent customer service to the patients and family members at PVH. Ball was nominated for Employee of the Month by a fellow employee. The employee had arrived at work and realized there were technical problems with the workstation and computers. Everything she tried would not work. She sent a text to Ball to see if he knew of anything else she could do and without asking, he arrived at the hospital within 20 minutes to help on his day off. Ball went above and beyond to help his fellow employee. Ball is considered an excellent example of the PVH Employee of the Month, and PVH is very grateful to have him on the team. In this recognition, he received a $100 check and a VIP parking space. He will also be eligible for the Customer Service Employee of the Year award with a chance for $500. Ball resides in Racine, Ohio and enjoys spending time with his nieces and nephews. 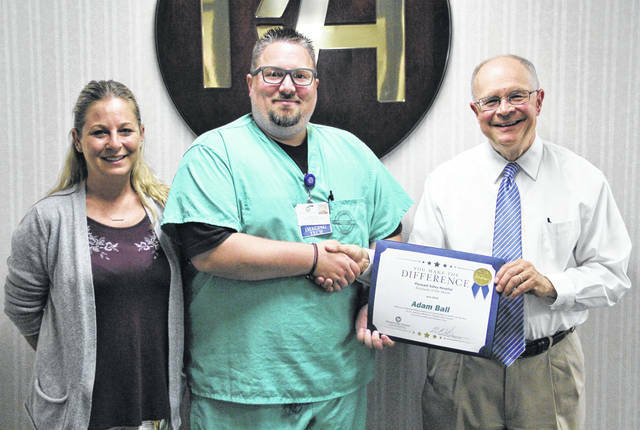 https://www.mydailytribune.com/wp-content/uploads/sites/42/2018/06/web1_0628.Community1.jpgJune Employee of the Month Adam Ball is pictured with Jenny Jenkins, radiology coordinator and Glen Washington, FACHE, PVH CEO.